It has been a long, wild ride for Infiniti, the company that Nissan birthed in the late 80s as a challenger in the German-dominated luxury car market. Sure, you can pick and choose which Infiniti models have edged out the competition over the years, and the company certainly deserves credit for inventing cutting edge technology like adaptive cruise — now becoming almost standard on all news cars. Yet, there is this lingering sense that no Infiniti car has quite matched the engineering of a Mercedes or BMW. Well, after driving the new Infiniti M37x for a week, and still fresh off a BMW 7-Series and Mercedes E-350 test a few months ago, I’m here to tell you: the M is a robust, technology-laden luxury car that feels much more in line with the leading makes and models. For those not acquainted with the upper echelon of sedans, there is that sense of heft and weight in a top-of-the-line car not present in most American-made models. Even the Infiniti G35 we drove last year did not feel quite as “tank”-like as the M. New technology that nudges you back into your lane if you cross a line or when another car is present, plus a much more sporty feel for cornering and driving at extreme speeds, make this a leader in the field. 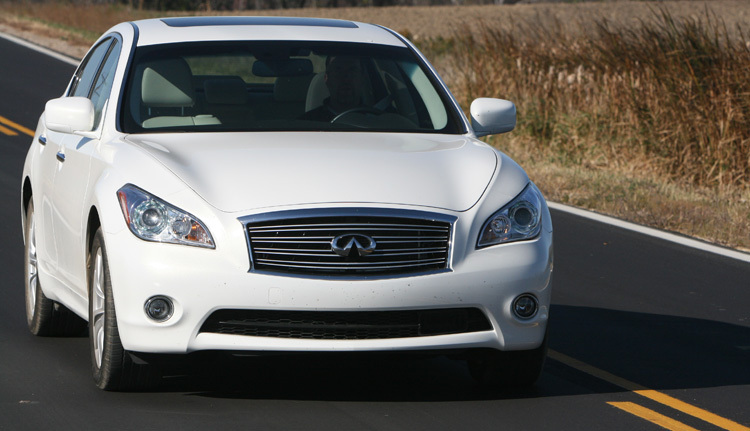 There’s no question that Infiniti was aiming for the sky with the M-series. Note that we drove the M37x AWD version, which has a 3.7-liter V6, while the M56 and M56x AWD has a 5.6-liter V8. Other than the engine specs, the cars are very similar – in appearance, handling, and technical features. Prices range from $46,500 for the M37 up to $60,00 for the M56X AWD top-end model. It all starts with the exterior styling. At first glance, the M37x has a more bubble-like look with a rounded hood and a curvy design – it’s not nearly as boxy as some older Infiniti models. What is not obvious from the pictures is that the car is quite large – it measures 194.7 inches in length, which is just about two inches shorter than the BMW 740i, and is 72.6 inches in width. This is a full-size, beefy, roomy sedan. Infiniti wanted the interior to mimic that sense of climbing inside the cockpit of an airplane, and that is exactly how it feels. There are Japanese Ash wood accents and a crème-colored leather (in the crème model we drove), but the cockpit sense comes from the curved seat and the fact that the controls are laid out so well around the driver – it never felt cramped or tight, but just about perfect. In fact, the BMW 7 almost felt slightly too open and wide, while the Infiniti gives you a better sense of control. We never had any trouble with any of the interior controls. The 8-inch navigation screen worked ideally for selecting music and setting a traffic route, and the real-time traffic and weather alerts worked perfectly as well. We’re not big fans of the analog clock so common in Infiniti sedans, because it’s a bit small and hard to make out the time, but the clock adds an extra touch of luxury. BMW and Mercedes are no strangers to high-tech features, but the Infiniti M seems out to one-up those companies with a few extra tricks. The two most impressive features were blind spot intervention and lane departure prevention. Let’s talk about both in terms of how they work – and if they worked well. One note about tech features in luxury sedans: if you are shopping for a $48,650 car like the M37x, you probably already know that there is a game in this market to add the latest gizmo, but the reality of driving is that you may use them for a week and then disable the option as a mere frill. (Another reality is that the tech packages are also not standard options and cost extra – but Infiniti does not break out the specific pricing on their web site so you will need to check with a dealer on that.) So we tested them extensively to see if they actually work and add value to everyday driving. Blind Spot Intervention is the next logical step after blind spot detection, which is becoming common on most new cars. For a warning, sensors on the rear of the car send out a wireless signal and then track the time it takes for the signal to come back. If it appears there is another car nearby in a passing lane, you will see a light on a side mirror or, on some cars, an audible chime. However, with intervention, the car applies slight braking to one side of the car to nudge you back into your lane. With lane departure warning, a camera actually identifies lane markings, both in the middle of the road and to the side, and will also chime at you or display a warning symbol that you are leaving a lane without signaling. 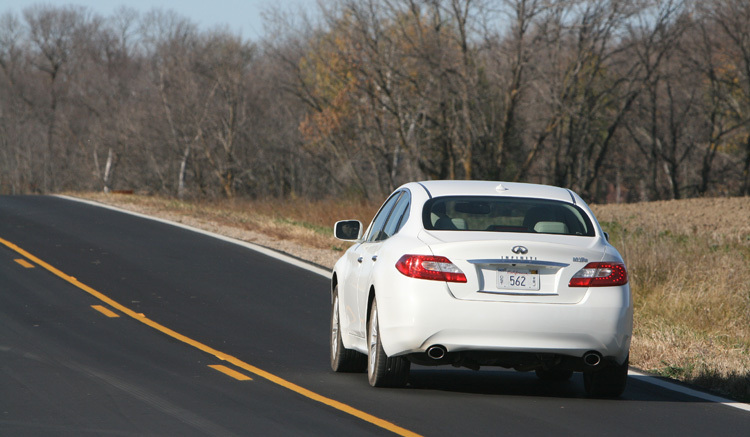 On the M37x, the car brakes slightly to nudge you back into your lane. Both of these features worked extremely well. We tested them at highway speeds, in city driving, and even on lonely country roads at much higher speeds. The only time the vehicle failed to nudge us back into a lane was in a very specific situation: a blinding light from a sunset. Oddly, all the sensors stopped working for a short time, including the warning chimes and even the adaptive cruise control, which automatically adjusts the speed of the car based on the distance from the car in front of you. A warning appears in the dash display that tells you sensors are not working, however. We do wish the two major advancements on this vehicle were enabled by default, though. Instead, Infiniti decided to make them optional – you have to press a button each time you start the car. That also brings up one small gripe about lane departure prevention: if you have a habit of changing lanes without signaling, you will feel that nudge every time. Of course, you can just disable the feature. The Infiniti M also uses forward-facing sensors and can brake automatically if another car passes in front of you and you do not brake right away. We never intended on testing this feature (no one likes to find out that it does not work), but in one quick hair-raising moment we did have another car run a stoplight at the last second – the M quickly came to a stop and we avoided an accident. A few other subtleties emerged during our test. At night, we noticed the door handles light up with a bright exterior dome light that is easy to see even from halfway across a parking lot (when you press unlock on the keyfob). During our drive, we also tested the Forest Air option – which seems a bit gimmicky since it sends a breeze of air in irregular patterns to mimic real wind. Interestingly, we found this setting to be a refreshing change from the typical blast of AC in most cars. The accident-avoidance features we tested were quite impressive, and they worked exactly as advertised. A few other features on the M are perhaps not quite as noticeable, however. One is that the new Active Trace Control system also adds a touch of automated braking around corners. 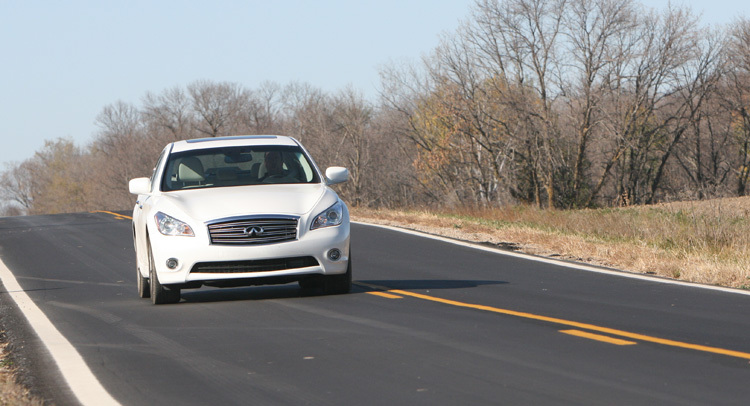 We tested this feature on a country road going about 70MPH and noticed that the M did hug the road and then released slightly around tight corners – including those that warned us to slow down to 45-55MPH or so. The M is designed for exceptional handling, and the car is highly configurable in this regard as well. For example, there’s a drive selector that lets you enable the “sport” mode for better handling, or you can use Eco mode to save on fuel. Oddly, we found that Eco mode just made driving less intense. The accelerator did not respond as quickly, which does save on gas. And, in Eco mode, the car shifts much faster into upper gears. In fact, we found the M to be almost annoying in Eco mode, much like driving a Honda or Toyota in that there is just not much heft at all. Switching to Sport mode, we breathed a sigh of relief – now that’s power under the hood. We tested the M in Sport mode going 0-60 at 6 seconds. The M uses a new direct injection system that purports to not only save on fuel economy but save on emissions as well, since the gasoline squirts directly onto the pistons. We found that, either due to our own driving habits or because of this new technology, that the M would accelerate a bit oddly at times, either in Standard, Eco or Sport mode (we never tried the Snow mode). The car seemed to struggle to accelerate just for a split second at times, but in reality was likely trying to intelligently manage fuel consumption – something we would appreciate if we had to fill up the M every week. Otherwise, handling was consistently smooth and precise – a true joy to drive in many different conditions. Our only slight complaint is that both the Mercedes-Benz E-350 and the BMW 740Li provided just a hair more power around corners and accelerating to highway speeds. We also strongly preferred the BMW 740i sound system, which is the best we’ve tested. 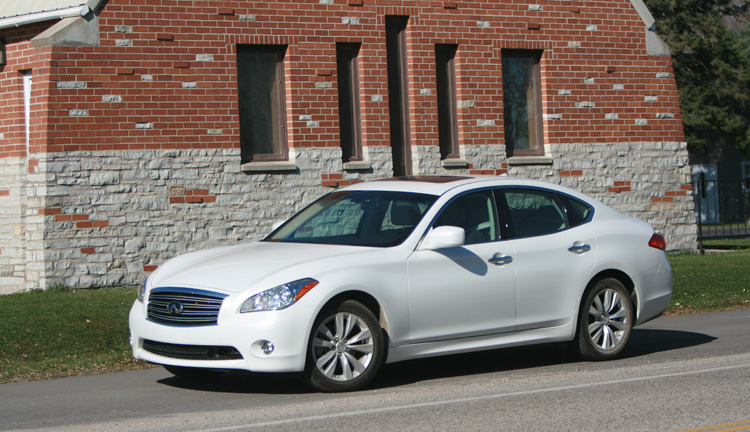 The Infiniti M definitely sounds crisp and uses sound sound-dampening technology to make sure you hear all of the highs and lows (and not any exterior road noise), but lacked that jaw-dropping surround-audio experience of a BMW. Yet, coming off each test drive with the M37x, winding around a few lakes and trees and driving a long highway commute over about a four hour period, we found that this vehicle just offers something unique and profound compared to previous Infiniti models. You just don’t want to get out of the car. The cockpit feel, the braking assistance, the sporty handling, and the quick acceleration all give you the sense that you are in a high-end luxury car with hardly any equal on the road. In the end, the M doesn’t just imitate a BMW or Mercedes, or attempt to mimic their technology features. Instead, it blazes a trail and winds up feeling like it is in a class of its own.